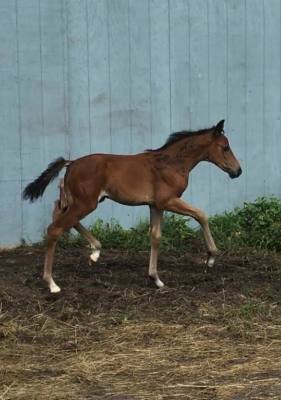 A keeper filly for Runningwater Warmbloods. Elfenadler H2O -- aka "Addie" -- is a dream filly for me in too many ways to count. First, she's out of one of the best mares I've ever seen: SPS Elfenfeuer (aka "Fury"). 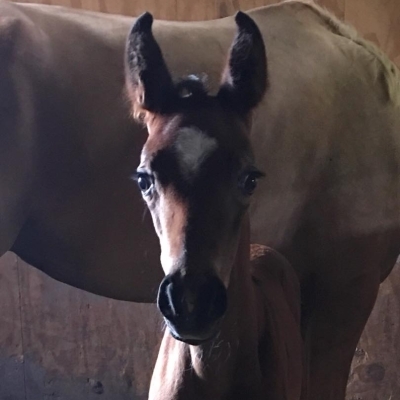 I was over the moon when her dam's incredibly generous owner, top rider Alice Tarjan, gave me the opportunity to try an embryo transfer out of her phenomenal mare. Fury won many championships from Young Horse to Grand Prix, including the National Amatuer Grand Prix Championship at USDF Finals in Kentucky -- twice. She was also campaigned by Lar Petersen as a mount for the Rio Olympics but was sidelined by an anjury. When bred to For Romance, Fury gave me an embryo that was immediately transferred at New Bolton Center into the palomino recient mare London. After a mere 409 days (yes, you read that right! 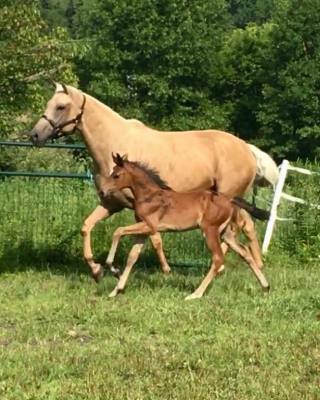 ), London delivered a tiny bay filly with exquisite features. Addie quickly proved she was worth the wait. She's the friendliest foal I've ever met and, like her dam, seems to prefer people to horses. She moves beautifully, too. 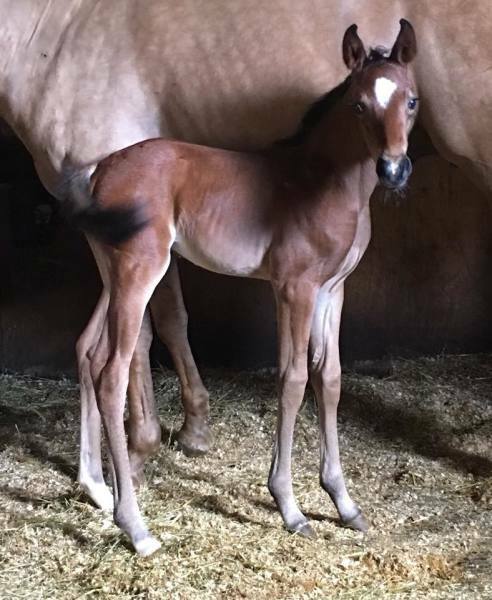 Addie descends from the illustrious "Elfen" damline of Ewald Grotelueschen, her dam Elfenfeuer's breeder, from which many successful upper level competition horses, States Premium mares, and licensed stallions have originated. Elfenfeuer completed her mare performance test in Vechta and was selected to compete in Rastede, then she was purchased at the Oldenburg auction in Vechta and imported to the US. Alice purchased the mare at four and did all the training herself. Elfenadler's sire, For Romance, passed his 30-day test in Schlieckau with super scores. He received a 9.25 for his trot and rideability, a 9.0 for his canter and an 8.88 for character. He descends from an excellent Voltaire dam line and possesses three excellent gaits. 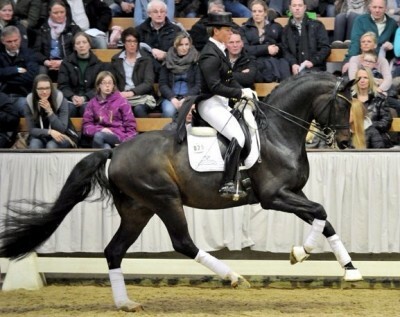 For Romance stood out brilliantly in the strong lot of stallions at the 2011 Oldenburg Verband licensing and the enthusiastic spectators in Vechta gave him standing ovations. In the third generation of his pedigree you find Don Schufro who took the Danish Champion title and won team bronze at the 2008 Olympic Games in Hong Kong under Andreas Helgstrand/DEN. The dam's sire, Sir Donnerhall I, was the 2nd Reserve Champion at his licensing, State Champion, the record-breaking winner of his stallion performance test, Vice World Champion of young dressage horses and Bundeschampion as well as the main premium winner of stallions with emphasis on dressage. He has sired numerous stallion sons and top auction horses. 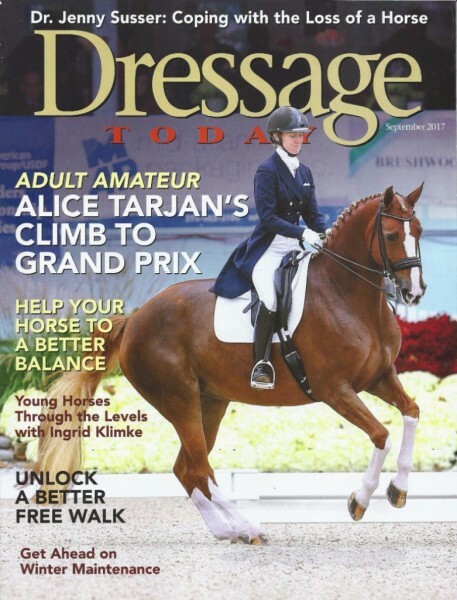 Addie's real dam, SPS Elfenfeuer was, among other achievements, ridden to two National USDF Amateur Grand Prix Championships by her owner Alice Tarjan. 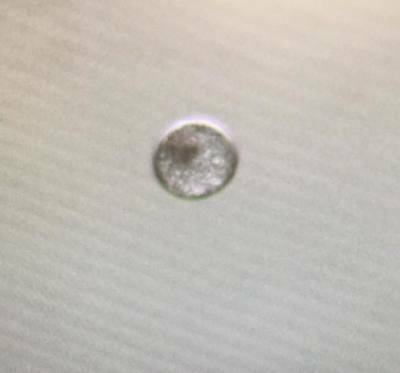 The embryo that became Addie.